An Introduction to Logical Machines: What makes us special? Logical Machines has been designing and manufacturing semi-automated scale systems of unsurpassed speed, accuracy, and dependability in Vermont since 1994. The entire focus of Logical Machines—from design & administration to production & service—is on the filling needs of small to medium-sized businesses. 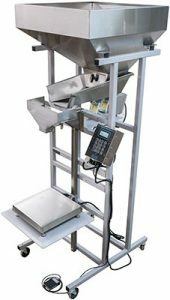 Because of our focus, we can offer the highest quality scales on the market at prices that will maximize your return on investment. All purchased machines components are all from top-shelf American manufacturers. All fabricated parts are made and assembled in Vermont. All of our machines are assembled, tested and shipped from our facility in Charlotte, VT.
Our proprietary software in our Logical Controller II enables the controller to set itself up and learn the characteristics of your product for maximum speed and accuracy. 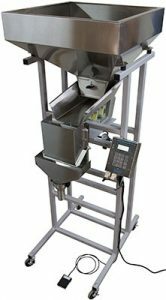 Speed and accuracy are maintained during every fill cycle by the Logical Controller II's ability to self-adjust on-the-fly. Click on a category below to go to our YouTube Channel and view a variety of products flowing through a Logical Machine. Testimonials: 25 years in business—we have lots! "We use it every day--a real work horse!" Select the right Scale: this is very important! Build a Machine and get an Instant Quote!